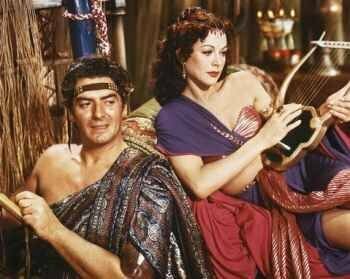 Although their names are forever linked, the story of Samson and Delilah is not a happy one. Today the name Delilah is associated with a voluptuous, treacherous woman, yet we feel she was harshly dealt with; if she chose or was coerced to betray him, remember that Delilah was a Philistine, and Samson was attacking her land. Samson, the strong, almost invincible man has a single weakness. And if you think about it, it isn't his hair... it's love. 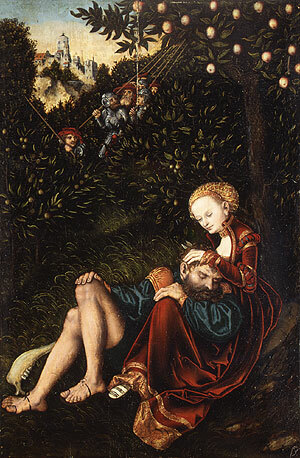 The Story of Samson and Delilah: Samson was born with the strength of many men, granted to him by an angel. It was intended that Samson would grow be a great warrior to help the Isrealites drive the Philistines from Canaan, the Promised Land. But there were conditions to be kept if Samson was to enjoy such great strength: he was never to cut his hair, never to eat raisins or grapes, not to drink wine and never to touch a dead body. He was also to keep his mind on driving the Philistines from Canaan. Indeed, Samson grew to manhood with the strength of several men. Against the Philistines he won several great battles single-handedly. The Philistines hated Samson because of the damage he caused to their cities and fields. At one time he removed the gigantic gates of the city. After ripping them off their hinges all by himself he carried them away on his shoulders. Samson set their fields afire and ruined their crops. In one battle he slew 1000 Philistines with the jawbone of a donkey. Of course the Philistines were very anxious to know Samson’s Secret. They noticed that Samson liked pretty women when he was not winning battles. So they convinced the beautiful Delilah she should get very well acquainted with him and find out the secret of Samson’s great strength. Delilah tried many tricks trying to get Samson to tell. For a long time Samson tricked back by telling her reasons that weren’t true. But finally he told about his hair. While he slept, Delilah and the Philistines cut off all his long shiny hair. With his hair gone, Samson’s strength was ordinary. The Philistines easily took him prisoner, burned out his eyes with a hot poker and chained him to a stone wheel pulled along a trough to grind grain into flour. Around and around he went, all day long, every day. Sometimes he was put on display so Philistine people might mock him and heap scorn upon their former mighty enemy. One day, pulling the stone, Samson felt the breeze blowing through his hair. His hair had grown long and he realized that his incredible strength was returning. After a while he was taken to be shown and mocked at a festival in the great temple of Dagon. Samson had seen the temple of Dagon years earlier and knew how it had been constructed, its enormous weight bearing upon two tall round pillars in the center. When he was taken before the throng, Samson stretched his once again mighty arms around the two pillars and pulled with all his incredible strength. The temple crashed down around him with dust and huge stones falling onto the gathered multitude. Samson died in the destruction along with 3,000 Philistines. As many Philistine leaders were lost in the temple, the Isrealites were able to win the war though Samson was no longer their champion. 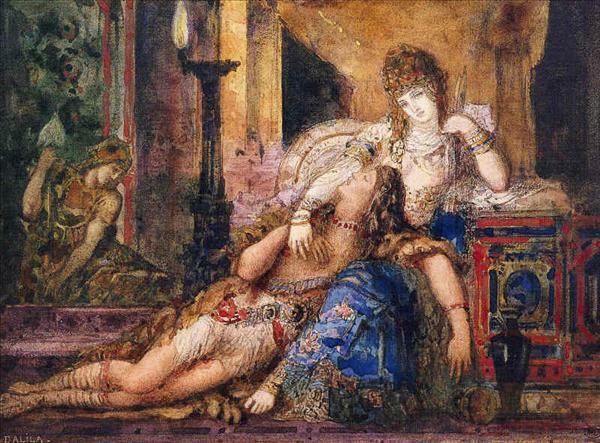 Samson and Delilah Tile Swap Puzzle as well as many other lovely and fun puzzles of Lovers.